Yesterday was one of those great stay at home and spend the day in the shop days! Darren and Nikki Miller stopped by with some bikes. 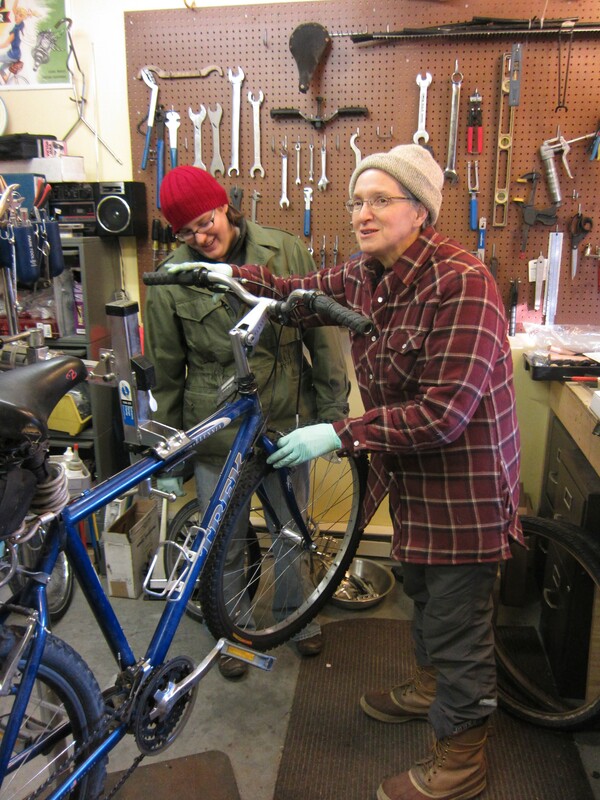 Nikki has recently returned to Bemidji and is a year round bike commuter. She brought her trusty 1998 Trek in for some TLC. 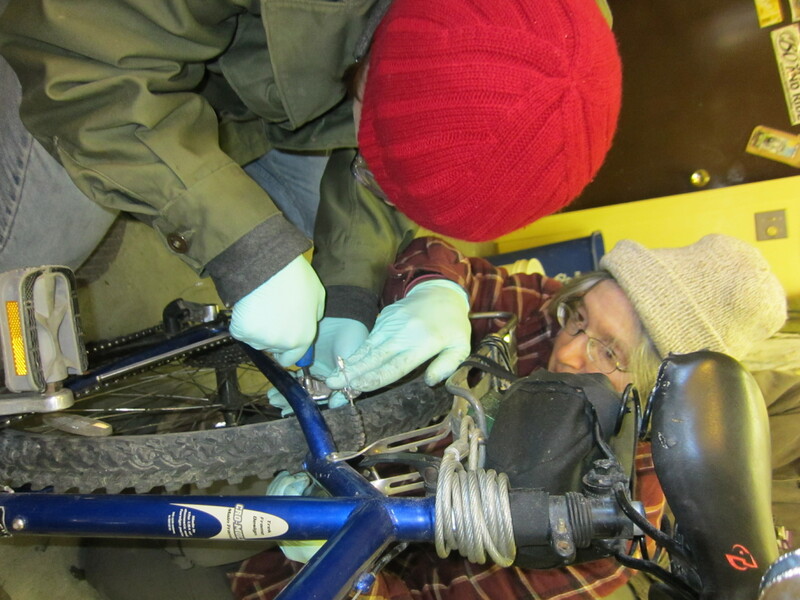 She learned how to overhaul hubs, install cassettes, change tires, and adjust brakes! Watch for her riding her blue bike around town and volunteering at the bike rodeo and other events. Along with the bikes they brought a six-pack of home brewed nut brown ale – beer, the traditional and much appreciated gift for your bicycle mechanic! Really good stuff. What a fun way to stay out of the cold! Diane and Nikki spend the day in the shop. But hey, Bemidji is cute and Northern Minnesota fun. We may be back someday. Yeah! We saw how Bemidji is an up-and-coming bike town! Lots of bikes…and bike racks! (Though ya gotta do something about that rack at the co-op. While cute, it’s not practical.) Bemidji was quite the oasis on our tour, as we came down from Winnipeg. While Thief River Falls was cute in its own way, Bemidji was the first stop in Minnesota where we wen’t “aaahhh”. (Well that and Lake Itasca!) We’ll definitely hit it up again. And you should do the big ride! You are right on about that Coop bike rack. Check out today’s blog entry. What a ride! Hahahaha That rack is hard to use.